Purple-throated Carib hummingbird feeding photographed in its natural habitat in the Morne Diablotins National Park in Dominica. Image credit: Wikipedia. 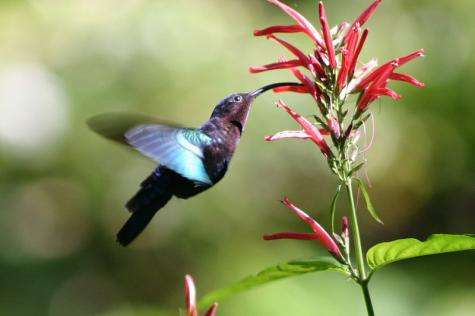 (PhysOrg.com) -- Ornithologists first put forth the theory that hummingbirds took in nectar using capillary action (where liquid rises against gravity in a narrow tube) in 1833 and since then no one has questioned it. In a new study published in the Proceedings of the National Academy of Sciences, research has shown that it is not capillary action at all, but actually a curling of the tongue to trap liquid. Associate professor of ecology Margaret A. Rubega and graduate student Alejandro Rico-Guevara from the University of Connecticut used a high-speed camera and see-through flowers they created to capture exactly what happens when hummingbirds drink nectar. They recorded 30 hummingbirds from 10 different species, as well as performed postmortem microscopic examinations of 20 other birds. Hummingbird licking nectar. A slow motion (165 times slower than real time) video of the lateral view of a Glowing Puffleg (Eriocnemis vestita) hovering and feeding on artificial nectar. Note the bifurcation of the tongue as soon as it contacts the liquid. The footage was taken at 500 frames per second (fps), and the timer is displaying in milliseconds. The hummingbird has a forked tongue which is lined with hair-like extensions called lamellae. When inside the flower, the tongue separates and the lamellae extend outward. As the bird pulls its tongue in, the tips come together and the lamellae roll inward. This action traps the nectar within the tongue. Hummingbird licking nectar (close-up). A slow motion (165 times slower than real time) video of the dorsal view of a Buff-tailed Coronet (Boissonneaua flavescens) clinging and feeding on artificial nectar. Note the lamellae opening and rotating as the tongue goes in and out of the fluid. The footage was taken at 500 fps, and the timer is displaying in milliseconds. They discovered during the postmortem examinations that this is a process that is automatic and requires no energy on the part of the bird. By manipulating the dead birds, they discovered that pulling the tongue past a liquids surface was enough to trigger the closing process. Hummingbird tongue trapping nectar (close-up). A 50× magnification, slow motion (330 times slower than real time) dorsal view video of a section of the post mortem tongue of a Ruby-throated Hummingbird (A. colubris) being retracted from a drop of artificial nectar. A spread drop of fluid (thin layer) is drawn along the stationary tongue. 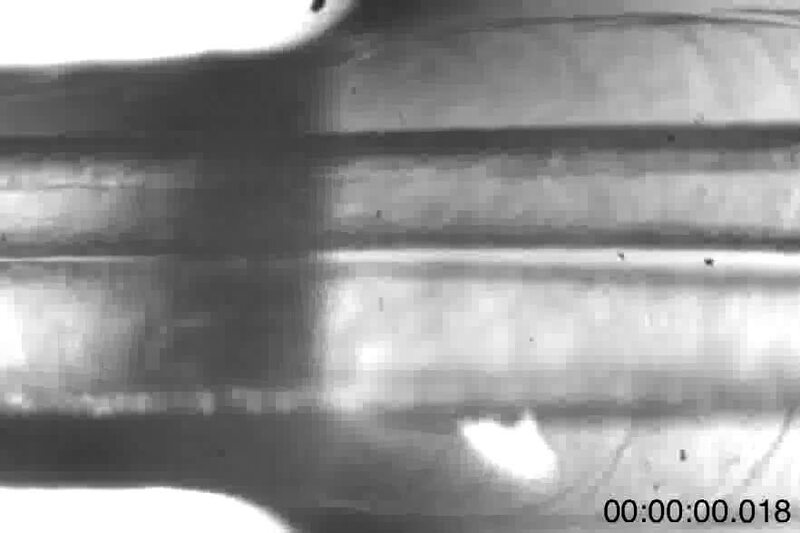 Note how each lamella curves closed and traps fluid as soon as it passes through the air-liquid interface. The footage was taken at 2,400 fps, and the timer is displaying in milliseconds. Hummingbird tongue trapping nectar. A 30× magnification, slow motion (280 times slower than real time) dorsal view video of the post mortem tongue of a Ruby-throated Hummingbird (Archilochus colubris) being retracted from a drop of artificial nectar. A spread drop of fluid (thin layer) is drawn along the stationary tongue. Note the rotation of the lamellae before they reach the interface, and that lamellae close and both sides of the tongue tip stick together when the tongue leaves the fluid. The footage was taken at 1000 fps, and the timer is displaying in milliseconds. Now that they have determined how the tongue works to collect the nectar, they plan to continue their research to determine how the birds are able to swallow. Their tongues can flick into nectar as much as 20 times per second so swallowing would need to be a rather quick action as well. Rico-Guevara plans to use X-ray microtomography to see exactly how swallowing takes place. Hummingbird tongues pick up a liquid, calorie-dense food that cannot be grasped, a physical challenge that has long inspired the study of nectar-transport mechanics. Existing biophysical models predict optimal hummingbird foraging on the basis of equations that assume that fluid rises through the tongue in the same way as through capillary tubes. We demonstrate that the hummingbird tongue does not function like a pair of tiny, static tubes drawing up floral nectar via capillary action. 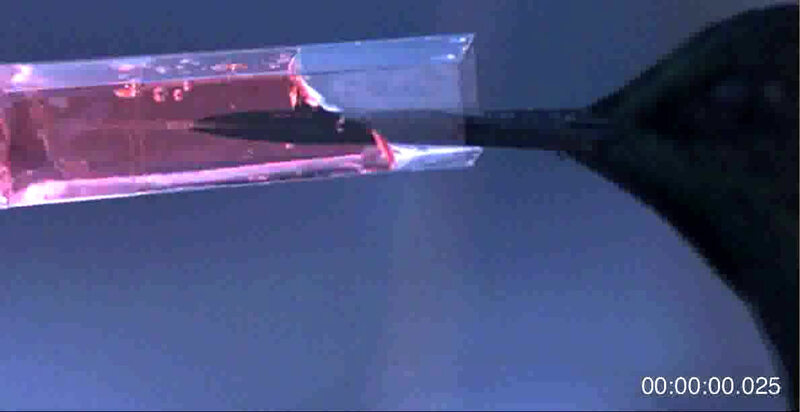 Instead, we show that the tongue tip is a dynamic liquid-trapping device that changes configuration and shape dramatically as it moves in and out of fluids. We also show that the tonguefluid interactions are identical in both living and dead birds, demonstrating that this mechanism is a function of the tongue structure itself, and therefore highly efficient because no energy expenditure by the bird is required to drive the opening and closing of the trap. Our results rule out previous conclusions from capillarity-based models of nectar feeding and highlight the necessity of developing a new biophysical model for nectar intake in hummingbirds. Our findings have ramifications for the study of feeding mechanics in other nectarivorous birds, and for the understanding of the evolution of nectarivory in general. 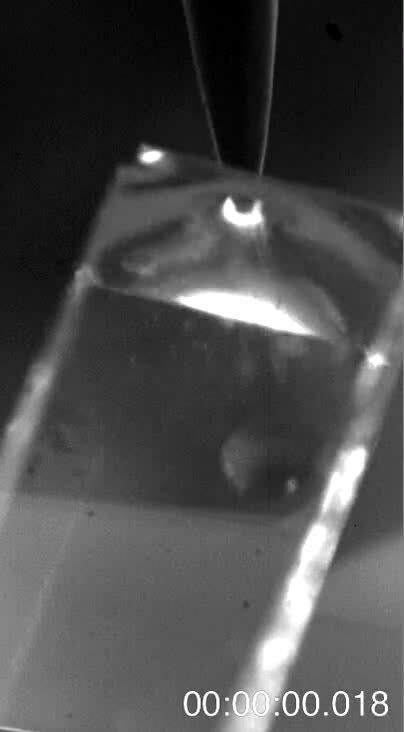 We propose a conceptual mechanical explanation for this unique fluid-trapping capacity, with far-reaching practical applications (e.g., biomimetics).